CERENIA® (maropitant citrate) is the first and only FDA-approved anti-vomiting medication for dogs and cats. It safely and effectively treats vomiting from multiple causes and prevents vomiting due to motion sickness (from car, boat, plane or other travel) in dogs. Give your dog CERENIA with a small amount of food 2 hours before traveling. Cerenia is intended for use in dogs 8 weeks of age or older. What is Cerenia used for? Cerenia Tablets are a broad-spectrum antiemetic used to prevent acute vomiting in dogs 7 months and older. Also to prevent vomiting in dogs 4 months and older caused by motion sickness or to prevent acute vomiting in dogs caused by chemotherapy, if given prior to the chemotherapeutic drug. Most antiemetics have been developed for use in people and are not suitable for small animals. Cerenia Tablets 24mg contain a novel class of antiemetic specifically developed to prevent and treat acute vomiting in dogs. There are many causes for vomiting, including systemic disorders, such as gastroenteritis or acute pancreatitis; bacterial infection such as leptospirosis; drug side effects such as anticancer drugs like cisplatin; motion sickness; or a clinical condition such as renal failure, adrenal insufficiency, intestinal obstruction or a central nervous system disease. It is important that the underlying cause for the vomiting be investigated and if it persists, consult your veterinary professional. 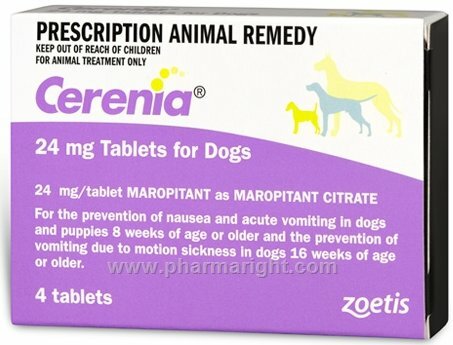 Cerenia Tablets 24mg contain maropitant, a novel class of broad-spectrum antiemetic that is used to treat and prevent vomiting in dogs caused by a wide range of emetogenic stimuli (causing emesis or vomiting). Vomiting is a complex process that is coordinated centrally within the central nervous system (CNS) by the vomiting or emetic centre, situated in the brainstem and comprising the area postrema and other nuclei (collection of nerve cells or neurons). The vomiting centre receives and responds to sensory stimuli transmitted by central and peripheral nerves, which initiates the vomiting process including contraction of smooth muscle in the digestive tract. The chemoreceptor trigger zone is also situated in the area postrema and induces vomiting in response to emetic drugs, such as chemotherapy drugs. Maropitant in Cerenia Tablets is a potent and selective neurokinin (NK1) receptor antagonist that blocks the pharmacological action of substance P, a neurotransmitter that plays an important role in emesis. A neurotransmitter is a chemical messenger that allows nerve cells to communicate. Substance P is a tachykinin neurotransmitter found in high concentration in the area postrema of the brain and is also found in the peripheral nervous system as well as in other sites such as the gastrointestinal tract. Substance P acts by stimulating its NK1 receptor to induce vomiting. Maropitant in Cerenia Tablets mimics the structure of Substance P and binds to the NK1 receptor, blocking the action of Substance P and thereby blocking the signal to induce vomiting from both the central nervous system (CNS) (brain and spinal cord) and peripheral nervous system (nerves and ganglia outside the CNS). Cerenia Tablets has rapid onset of action (within one hour) and lasts for 24hours and is, therefore, suitable for once daily treatment. Cerenia Tablets contain the active ingredient maropitant citrate 24mg, a broad-spectrum antiemetic that is used to prevent vomiting in dogs caused by a wide range of emetogenic stimuli. 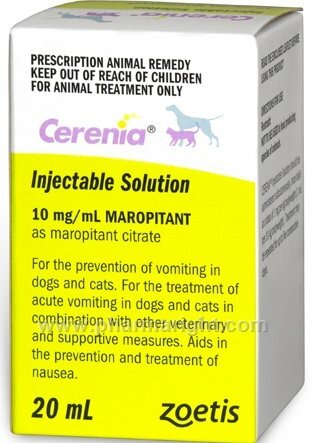 Maropitant in Cerenia Tablets 24mg contain maropitant, a broad-spectrum antiemetic that is used to prevent acute vomiting in dogs 7 months and older. Also to prevent vomiting in dogs 4 months and older caused by motion sickness or to prevent acute vomiting in dogs caused by chemotherapy, if given prior to the chemotherapeutic drug. There are many causes for vomiting, including gastroenteritis, bacterial infection, side effects of anticancer drugs, motion sickness or a clinical condition such as renal failure. Vomiting is a complex process that is coordinated by the vomiting or emetic centre in the brain. Maropitant in Cerenia Tablets is a potent and selective neurokinin (NK1) receptor antagonist that blocks the pharmacological action of substance P, a neurotransmitter (chemical messenger) that plays an important role in vomiting and is found in high concentration in the emetic centre. Maropitant in Cerenia Tablets binds to the NK1 receptor blocking the action of Substance P and thereby, blocking the signal to induce vomiting from both the central nervous system (CNS) (brain and spinal cord) and peripheral nervous system (nerves and ganglia outside the CNS). Cerenia Tablets has rapid onset of action and lasts for 24hours and is, therefore, suitable for once daily treatment. What are the side effects of Cerenia? The most commonly reported side effects for dogs taking Cerenia Tablets24mg include hypersalivation, diarrhoea, lethargy, loss of appetite, fever, flatulence, irritation or pain at the site of injection. When should Cerenia not be used? How should Cerenia be given? For prevention of acute vomiting in dogs 7 months or older Cerenia Tablets 24mg should be administered orally, at a minimum dose of a minimum dose of 2 mg/kg (0.9 mg/lb) body weight, once daily for up to 5 consecutive days. To prevent vomiting in dogs 4 months and older caused by motion sickness, Cerenia Tablets should be administered orally, 2 hours prior to travel, with a small amount of food, at a minimum dose of 8 mg/kg (3.6 mg/lb) body weight, and then once daily for up to 2 consecutive days. After the first dose do not give a full meal to your dog before travel. Cerenia tablets 24mg may be used interchangeably with Cerenia Injectable Solution for treatment and prevention of acute vomiting, after initial treatment with Cerenia Injectable Solution. How long should Cerenia be given? For prevention of acute vomiting in dogs Cerenia Tablets 24mg should be administered for up to 5 consecutive days. For prevention vomiting in dogs caused by motion sickness, Cerenia Tablets should be administered for up to 5 consecutive days. If you miss a dose of Cerenia Tablets 24mg administer it as soon as you remember, unless it is time to administer the next dose, then skip the missed dose. Do not administer a double dose. How should Cerenia be stored? You should store your Cerenia Tablets 24mg between 20- 25°C in a cool dry place.